The accumulation of FOG materials has caused a fatberg in the area, which crews have worked to clear. NORTHERN IRELAND WATER has appealed to home and business owners to be careful about what they put down their drains. 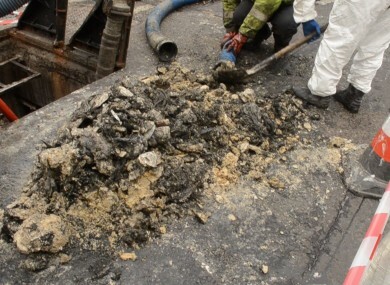 The appeal comes after NI Water crews spent yesterday undertaking a massive project on the Dublin Road, Belfast, clearing fat, oil and grease (FOG) that has built up from locals pouring fat into the sewers rather than using grease traps and binning it. The accumulation of FOG materials has caused a giant fatberg in the area, which crews have worked to clear. “The Dublin road houses a number of fast food outlets, therefore the problem of FOG in the sewers is significant in this area. While most businesses use grease traps and bin their waste correctly, those that don’t are contributing to a massive fatberg in the sewers around the area. McCready says the crews are onsite in the mornings on Sundays because of high traffic in the area. But, he says, it’s not the first fatberg they’ve encountered. “We also recently discovered another fatberg on the Shankill Road which was so big, it rose to the top of the sewer and had been imprinted with the manhole! “We would appeal to all our customers, especially food outlets, to dispose of their FOG appropriately. For householders, let it cool and then put it into the bin. Alternatively, pour it into a disposable container and take it to your local oil bank. Businesses also risk blocking their own drainage systems, which results in extra costs being incurred in clean-up efforts. These fat blockages can not only result in out of sewer flooding, but odour problems and the risk of rat infestations both near and beyond your premises. In the last two years NI Water has spent over £5 million clearing blockages from the sewer system for which 70-80% were caused by FOG and inappropriate items. Crews will work over the coming Sundays to clear the blockages. Email “This giant fatberg has clogged the sewers in Belfast”. Feedback on “This giant fatberg has clogged the sewers in Belfast”.